Water Year 2017, which began on Oct. 1, got off to a rip-roaring start this month in terms of rainfall, and now records are falling for October rainfall totals across the Kitsap Peninsula. As shown in the three charts on this page, the graph started climbing steeply above the lines shown — including the green lines, which denote the highest annual precipitation recorded for the past 25 to 33 years. 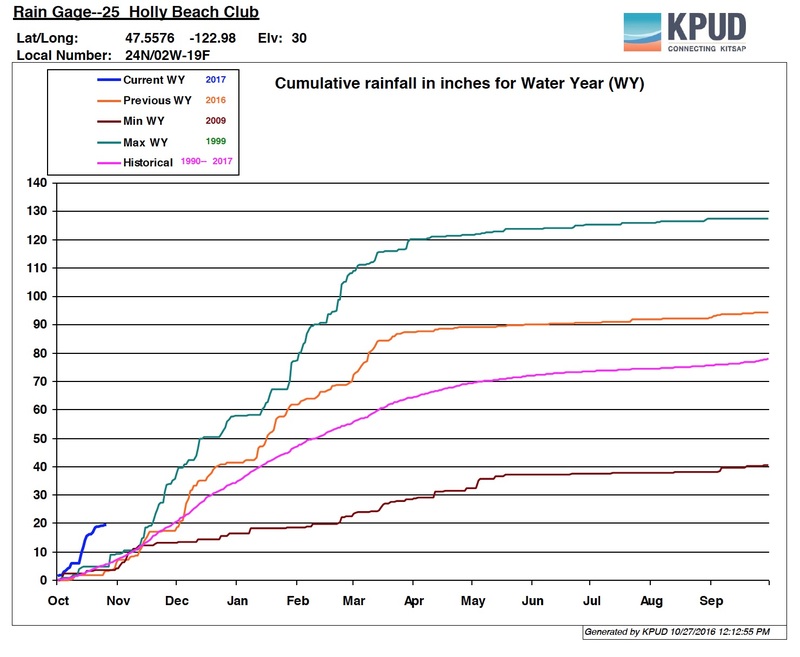 So far this month, 19.5 inches of rain have fallen at Holly, which has averaged about 7 inches in October for the past 24 years. 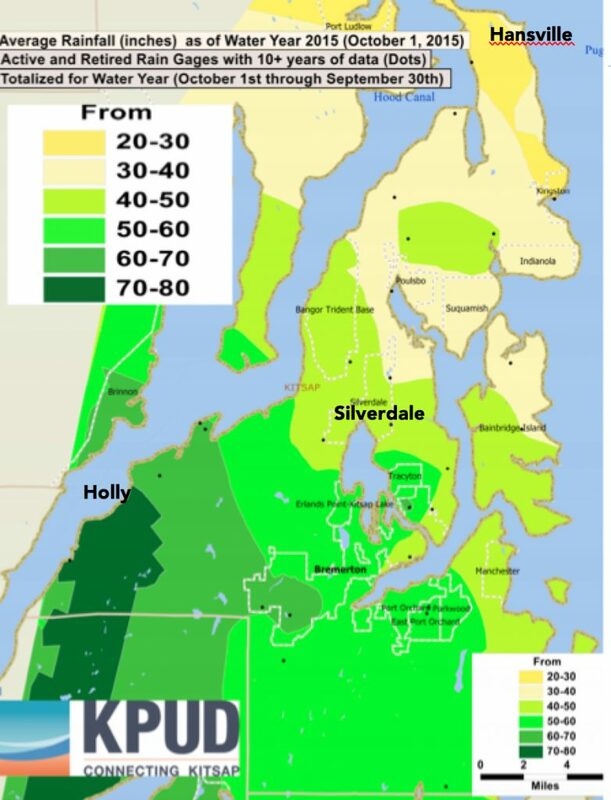 As you can see in the annual rainfall map at the bottom of this page, Holly lies in the rain zone on the Kitsap Peninsula — the area with the greatest amount of rainfall in most years. With four days left in the month, Holly has about an inch to go to break the record of 20.5 inches going back to 1991. At the northern tip of the peninsula is Hansville, located in the rain shadow of the Olympic Mountains. Hansville this month has received 7 inches of rain, exceeding the long-term average of 2.8 inches for the full month. 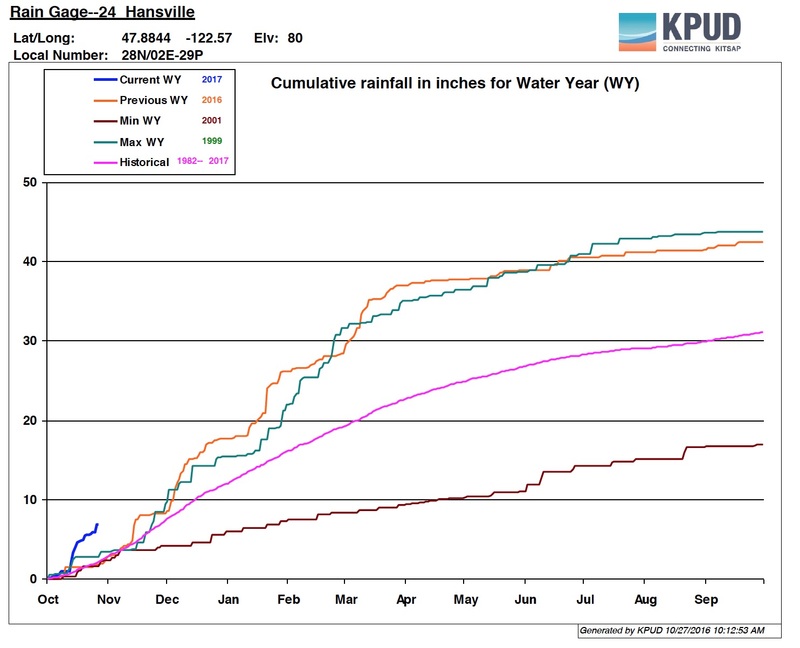 Hansville has already broken the rainfall record of 5.5 inches measured in October 1998. 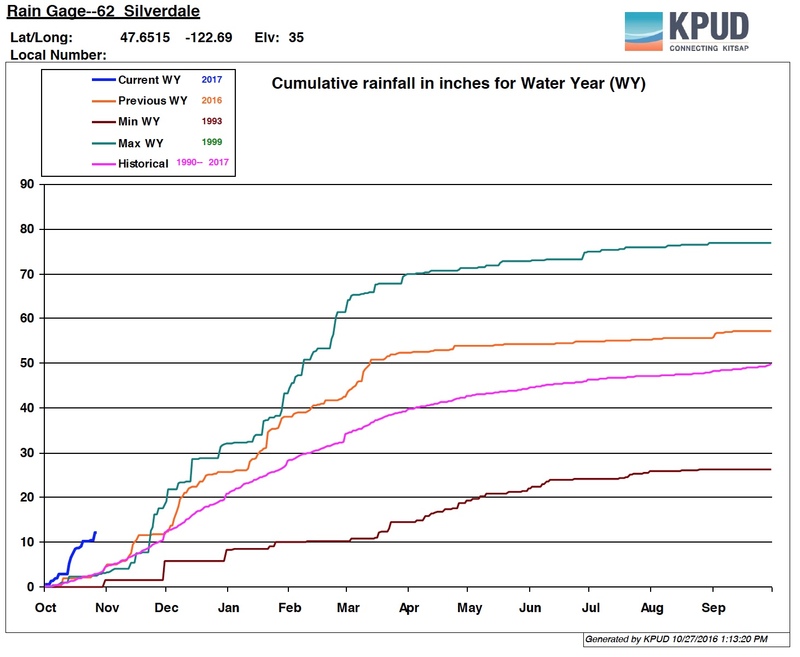 In the middle of the Kitsap Peninsula, 12.3 inches of rain have been recorded so far this month in Silverdale. That was enough to surpass the long-term record of 12.1 inches yesterday, and it is three times the October average of 4 inches. These numbers are derived from data collected from rain gauges all over Kitsap County collected and analyzed by Kitsap Public Utility District. The data are easily accessible on the map of gauging stations on the PUD’s website. I especially like to follow the rain gauge charts as the lines go up and up with each rain event. Last year, for example, the Hansville rain gauge toyed with the record, as shown on this page. The orange line (Water Year 2016) weaved its way above and below the green line until July, when it began tracking below the record. For the past water year — October 2015 through September 2016 — all rain gauges in the PUD’s database exceeded the long-term average, according to Mark Morgan, water resources manager for the PUD. This month’s excess rains have pushed streamflows up quickly, as indicated by stream gauges across the county. That’s good news for salmon, which tend to move upstream with adequate flows. The greater-than-average rains last year and the rains showing up this fall also are good news for groundwater supplies, Mark said. Rains not only recharge aquifers but they also mean that people don’t need to water their lawns as much when rains continue in the summer. The outlook into early next year is for above-average precipitation for parts of the Pacific Northwest and the northern Rocky Mountains, according to the National Oceanic and Atmospheric Administration. Below-average precipitation is expected across the southern U.S.
As ocean conditions develop this fall, NOAA’s Climate Prediction Center has reissued a “La Niña watch.” La Niña is associated with the cold phase of a cyclic climate pattern that typically leads to wetter conditions in the Puget Sound region.